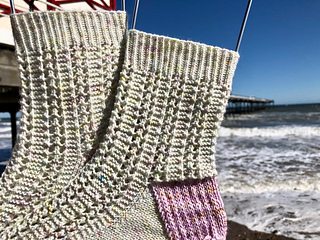 These socks were inspired by a recent trip that we took to the seaside. 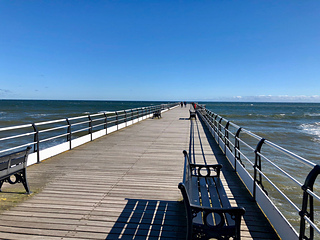 The town we visited has a wonderful Victorian pier, and a fenicular railway that descends down the cliff to the beach. It’s very easy to imagine the ladies and gentlemen of that era, dressed up in their finest clothes. They would be enjoying an afternoon promenade down the pier, whilst their children played happily in the sand. I began to imagine a design that captured the feeling of a Victorian seaside. 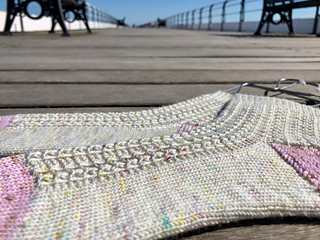 The garter stitch represents the waves lapping on the shore, with the lace design reflecting the pier that stretches out into the sparkling sea. The socks are knitted top down with a heel flap and gusset, and my Umbrella Toe. 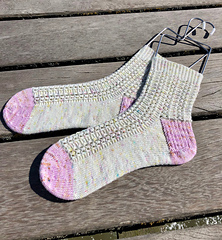 The heels and toes are knitted with a contrast yarn. The pattern contains both written and charted instructions. These are the perfect summer knit !